Hedges have many uses in landscape design, from utilitarian to simply being visually attractive. Practical applications include using a hedge to block damaging winds, block out neighborhood noise and create an affective privacy fence. Hedges can also be used to visually draw the eye from one area to another or to create an attractive separation of areas within your landscape. In many cases when you decide you want a hedge, you need it to grow and become established and reach maturity fast. When selecting plants for a fast growing hedge, it is important to define what constitutes fast growing. Annual plants always grow faster than perennials but for a hedge annual plants are not appropriate as you are looking at growing perennial shrubs or trees. According to Naturehills Nursery, a fast growing tree is one that grows in height more than 2 to 3 feet annually. A fast growing shrub would be similar in growth, reaching its mature height within 3 to 4 years. How fast your hedge plants grow will depend on other factors, including soil, environmental conditions, and proper planting and care. One of the greatest advantages of using evergreen shrubs for your hedge is you can create a dense, year-round screening for wind or privacy. Many homeowners believe evergreen shrubs are slow growing, but there are many that will grow quite rapidly to fill in your hedge and reach sufficient height. For northern gardeners in USDA hardiness zones 5 to 7, juniper bushes are the fastest growing hedge plant, with holly varieties of "Nellie R. Stevens", "Ajax", "Agena" or English Holly "Monier" also fast growing. USDA zone 7 to 10 homeowners can select privet, Japanese pieris or black bamboo, which can grow 5 to 10 feet a year and is not as invasive as other bamboo varieties. Deciduous shrub hedges will drop leaves in the fall but offer a changing visual appearance throughout the year with flowers, colorful foliage and interesting bare branches. Burning bush, viburnum and butterfly bush are the fastest growing, with all growing 4 feet or more per year and having a spread that is comparable, enabling the hedge to fill in fast. 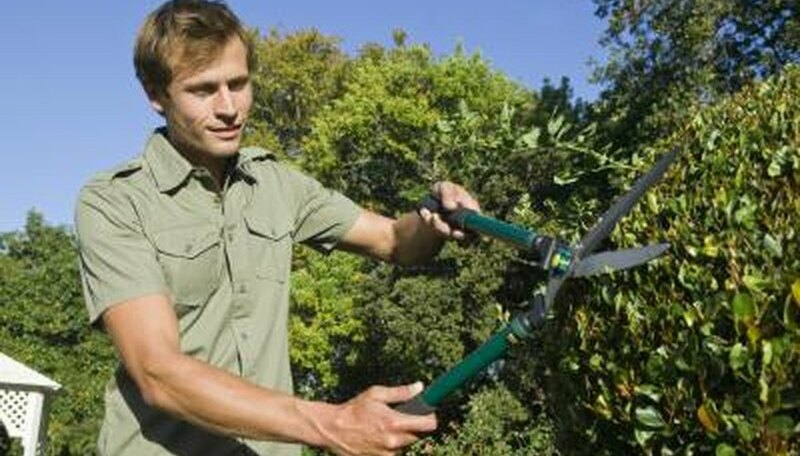 Fast growing deciduous hedge shrubs will often need more maintenance in the form of pruning to keep the hedge manageable. You can also use fast growing trees to establish a hedge, particularly if the hedge is needed as a wind barrier. Willow tree varieties are the fastest growing trees, adding 4 to 8 feet per year, but the trees drop their leaves in the fall. Thuja, cypress and Norway spruce are evergreen trees that grow fast, 3 to 5 feet every year. If slower growing trees are ultimately wanted for the hedge, a homeowner can plant slower growing trees between the faster growing trees, removing the fast growers once the slow trees have reached the desired height.